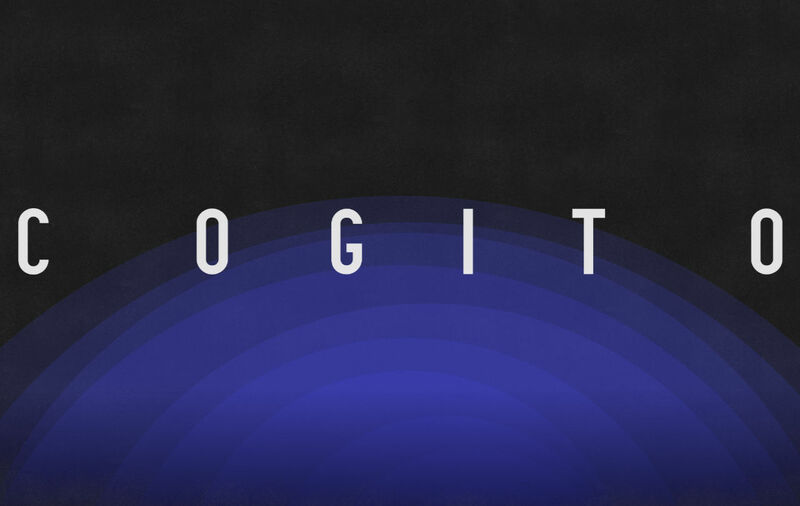 COGITO is an interdisciplinary hybrid narrative sending thoughts into outer space as radio waves. The project is staged at the Dwingeloo radio telescope in The Netherlands. One visitor at the time enters the cabin of the radio telescope and sends her or his brain activity into the cosmos while viewing an immersive video of the Earth seen from space. A project by Daniela De Paulis. The narrative unfolds so that one visitor at the time is guided inside the cabin of the Dwingeloo radio telescope where s/he is fitted with a professional encephalogram (EEG) system and a virtual reality headset (Oculus). The preparation is carried by a neuroscientist and takes approximately fifteen minutes. Once the preparation is completed, the brain activity of each visitor is recorded while s/he is viewing an immersive video of the Earth seen from space; in real time, the brain activity is converted into sound and transmitted into space by radio operators of the CAMRAS team, using the antenna of the Dwingeloo radio telescope pointing still. The brain activity is thus transmitted across a large portion of the sky, without a specific target, highlighting the Earth’s rotation and our place in the cosmos while the experience takes place. Before entering the cabin and transmitting their brain waves into space, visitors are guided by an anthropologist and performer artist to explore the area surrounding the scientific facilities for experiencing the animal and botanical diversity of the Dwingeldverveld National Park. The naturalistic visit is based on principles of Big History and aims at inspiring in the visitors a stronger sense of connection with the Earth’s habitat, before symbolically leaving the planet. COGITO is an interdisciplinary, collaborative project and the result of six years research at the Dwingeloo radio telescope and ASTRON (The Netherlands Institute for Radio Astronomy). The project has been partly developed as a reflection upon the use of the electromagnetic spectrum, and especially radio waves, by radio astronomers for gathering data of cosmic phenomena and upon the type of knowledge we gain from the discovery of such remote events that cannot be known through direct sensory experience. Radio waves transmissions have been expanding the human reach into the cosmos, towards places where manned space exploration might never be able to reach, allowing us to remotely explore outer space and exposing the conventional perception of our surroundings to a virtual yet uncannily real and detailed landscape, made of matter still to be defined. Radio waves become thus the mean for the virtual, human space travel and the carriers of a new found cosmic awareness and cultural contents, exceeding their scientific and technological function. How does the knowledge acquired through remote observation of the universe influence our cognition? How does the mind interact with the matter of such distant universe and vice versa? COGITO is a conceptually complex art project, however the main idea behind it is to create a connection between the mind of the viewer and his or her idea of ‘universe’. As cosmology progresses in the discovery of the universe, the role of the mind in the interpretation of the picture of ‘reality’ remains largely unkown. The way our mind works might be fundamental to understanding the universe, the mirroring effect between mind and matter might be essential to comprehend our very unique – and possibly arbitrary – notion of the universe and our life within it. Also the conceptual framework underpinning the project expands the discourse into philosophy and the unresolved debate on the mind-body Dualism. Amongst the sources of inspiration that helped shaping COGITO is the philosophical science fiction novel ‘Solaris’, written in 1961 by Polish author Stanislaw Lem. Like the book, the project reflects upon the themes of human memory, experience and the possible inadequacy of communication between human and non-human species. Since its early development in 2014, the project has been informally supervised by space philosopher Frank White, co-founder of the Overview Institute and author of ‘The Overview Effect’, an influential essay in which he investigates the cognitive shift happening in the mind of the astronauts after witnessing the sight of the Earth from outer space. White reports that as a result of the ‘Overview Effect’, the mind of the astronaut develops a notion of a unified planet and of greater ecological and social awareness. This concept deeply influenced the development of COGITO. The immersive video created especially for the project attempts to evoke the ‘Overview Effect’, while at the same time leaving space for open interpretation and critique rather than functioning as an outreach platform by endorsing a particular current of thought. Scientific accuracy is highly important for COGITO, in fact the scientific language is the ‘material’ of the project and it is essential that people experiencing the art installation are not deceived regarding the scientific accuracy of their experience (within the limits of our current scientific understanding of brain activity analysis). For the project we use the Nautilus, an advanced electroencephalogram (EEG) device produced by GTEC: the EEG research has been developed in collaboration with neuroscientists Robert Oostenveld, Stephen Whitmarsh and Guillaume Dumas. The EEG reading is able to detect the complex pattern created by the unique interaction of the brain waves in time, showing that the mind is engaged in negotiating different stimuli, produced both by the sensory and psychological experience. The EEG reading however is not invasive and cannot detect the object of thoughts, therefore it presents no privacy concerns. For COGITO the neuroscientists developed a code for interstellar transmission, the first of its kind, both accurate from the artistic and scientific perspective. The code aims at communicating to a potential extraterrestrial listener the spatial and psychological nature of our advanced mammalian brain. An extraterrestrial intelligence would be able to reconstruct the signal and perhaps understand how it was created and the complex nature of our thinking. However due to the great cosmic distances it is unlikely that the radio waves will be ever detected and received in such a way they will be clearly interpreted, for this we would need a much greater radio telescope. The project has been presented at several SETI (Search for Extraterrestrial Intelligence) conferences and discussed with specialists in the field. We are very aware of the controversy in transmitting powerful signals into space in the attempt to communicate with an extraterrestrial intelligence. We don’t expect an extraterrestrial intelligence to reply to our transmissions, in any case the aim of the project is primarily to travel into space with our mind to reflect back upon ourselves as humans, inhabiting Spaceship Earth. In general, the project aims at prompting philosophical and artistic enquiry, and the thought of departing from Earth towards a journey into the unknown, leaving our home planet behind. The immersive video created for COGITO in collaboration with Sandro Bocci includes some of the footage captured by the camera onboard the International Space Station, showing the curvature of the Earth as the station rotates. The footage however is greatly reinterpreted, combining the ISS material with experimental film techniques which should help evoking in the viewer memories, an aesthetic experience as well as sensory feedback. The footage aims at giving the impression of being produced by the mind and the eyes of the viewer, evoking flickering, ancestral memories of our evolutionary past from stellar dust up to our present sensory perception of our home planet. Combining experimental footage with realistic views of the Earth seen from space, the video attempts to disrupt the familiar image of our home planet, inducing a more introspective journey into the perception of our place in the cosmos, delving more deeply into subjective memories and mental associations. It is expected that each person will experience the sight of the Earth seen from space in a very subjective way and it is possible that the sight might evoke very different memories and trains of thoughts in the mind of each viewer.